The new improved Korea – Hello Korea ! IMG_1451, originally uploaded by Almost-Human. 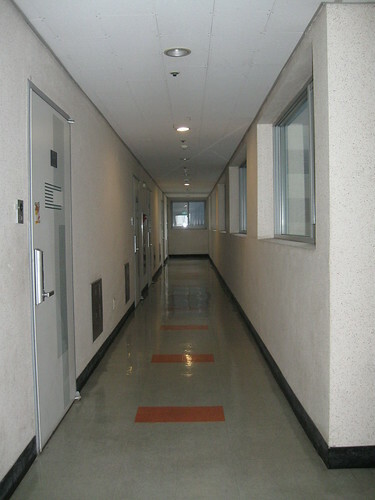 So this is a parting shot of the hallway to my officetel apartment. So much personality. So warm and inviting. NOT! I say SAYONARA with no regrets! And THIS is what people want to / dream of living in? It killed my soul coming home to this every day. This rich experience (cough, cough) is the blight of Korea and what the current administration and their rich developer friends want to replace huge chunks of Seoul with. They seem to think that adding some pedestrian walks and amenties at the base of these 14, 20+ floor high buildings can ameliorate the monstrous presence of these concrete monoliths. My very cool new old neighborhood is slated for the wrecking ball in four years. A whole way of life will be gone with these buildings: the women knitting, the truck vendors, the neighborhood dogs, the children playing, the tiniest restaurants and bars, the hardware man, etc. I’m all about Sesame Street, and this Korean Sesame Street will soon be nothing but history. Many of my co-workers live in Seoul and commute an hour to work. I ask them why and they say, “because Anyang (or insert any new city’s name) is too expensive.” Soon, Seoul will be just as expensive, and then where will they live? Where will all the people who depend on this 60’s and older housing stock go? This is one of the main reasons I’m not in architecture anymore. Development isn’t a response to growing pains – it’s just market hype to turn over yet-still-another-buck. And that greeds seems inexhaustible. I would get lost every day. I’ve been lamenting the onslaught of sameness for years now. And not just the architecture.